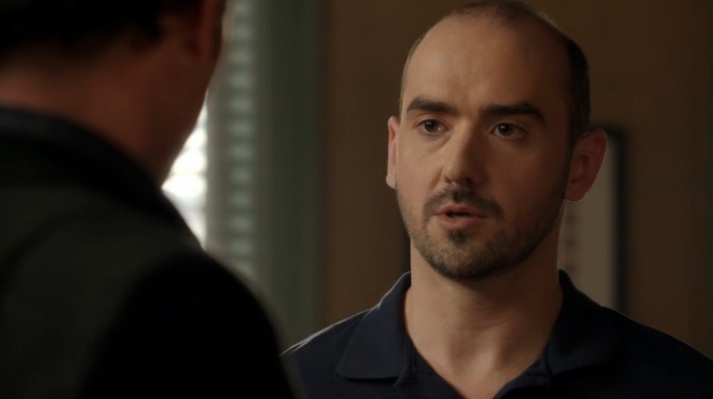 Look, I know you love the 49ers. You’re a rabid fan; painting yourself in the team colors, going to every game, drinking until you pass out. 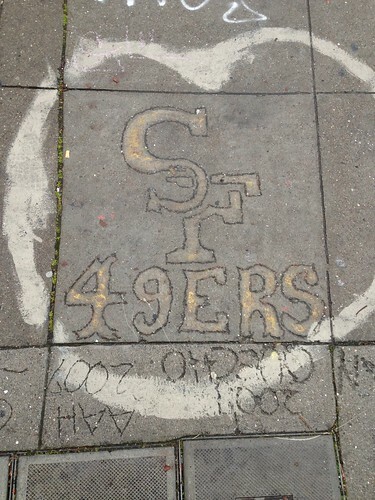 But you can’t show your appreciation for a team by scraping their logo into the cement. No, not because you’re defacing public property, but because you’re violating precious NFL trademarks. Football is a business, and by stealing the NFL’s intellectual property, you’re basically stealing from your favorite players. How are they going to put food on the table for their families? So next time, instead of scratching team names into wet cement, let’s show our true love for our local teams the only way we can — by purchasing officially licensed $60 jerseys. Q: Can you spot the gramatical errors on the above sign? A: No. There are so many problems it’s impossible to assign a concrete number. 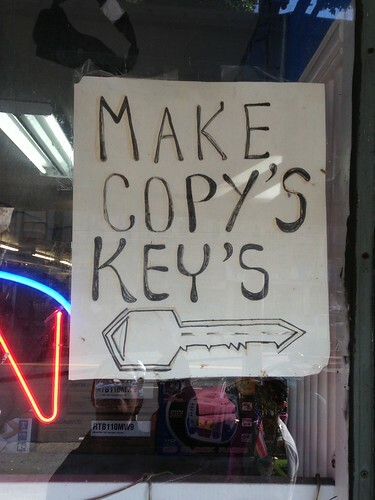 For example, should the sign say “We make copies of keys”? 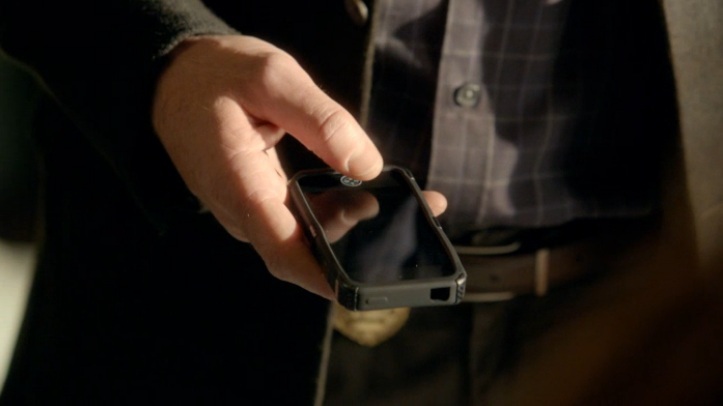 Or maybe it could simply read “Keys copied”? Regardless, there’s more than one correct answer. 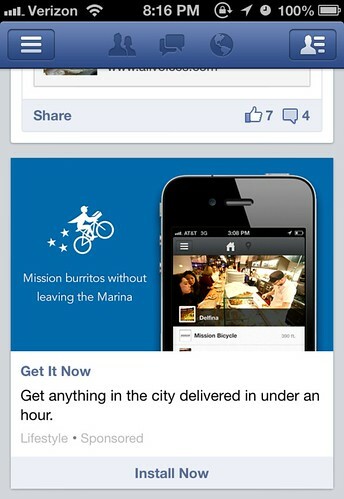 The only thing we can say for certain is that apostrophes should not be involved. 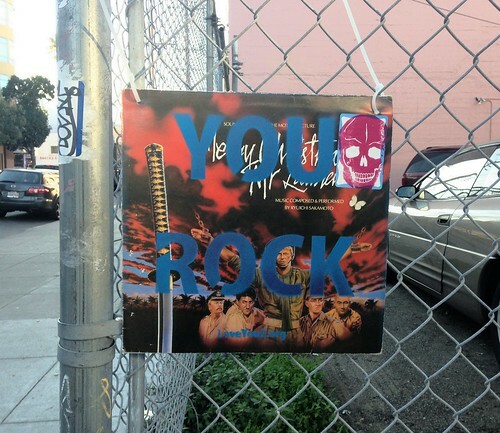 “YOU ROCK” proclaims a cardboard sign at 15th and Minna. But that’s not any old piece of cardboard, no sir. It’s an album cover from a record; the soundtrack to Merry Christmas Mr. Lawrenece, composed and performed by Yellow Magic Orchestra keyboardist Ryuichi Sakamoto. The URL on the bottom of the sign takes you to LoveYou2.org, a blog about a project to spread positive messages to the world in an endless variety of mediums and formats. The piece I found is part of a series documented in this blog post. 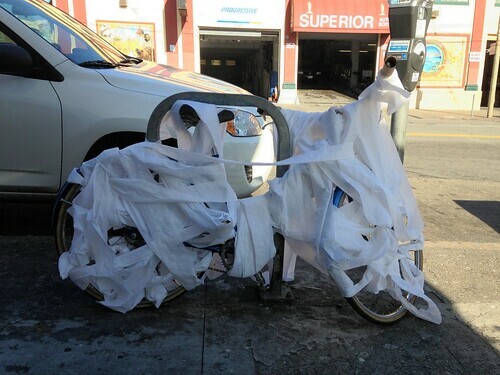 Looks like there’s a few others around the neighborhood I have yet to locate. If I find any more of this series I’ll update this post with locations. 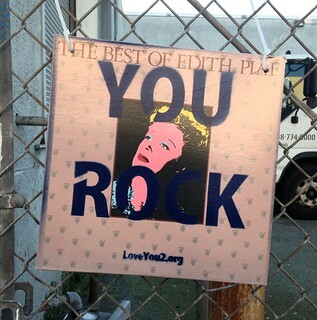 UPDATE Jan 17: This one featuring The Best of Édith Piaf is on Capp and 16th on the fence outside the Walgreens parking lot. You are currently browsing the MrEricSir.com blog archives for January, 2013.